I'm posting this issue because veeam support has urged me to do it, so they can overview the impact this issue is having in their user's community. It's important that all of you that is facing this same problem take the time to update this ticket in any way, so Veeam can assign to this question a high or low priority. The problem is that when the "Use Encryption" option is enabled in the "Options" tab of the properties of a Tape Pool, the performance of the jobs that use this pool becomes a fraction of the speed obtained without this option selected. In my case, using LTO3 drives in a MSL6030 from HP, the normal speed of a backup job using an unencrypted pool is 80MB, that is the full speed of a LTO3 drive, while the speed obtained using this same pool but activating the option indicated before, the speed slows down to 34MB. The answer from Veeam is that this issue is considered to be by design, just because the encryption process is made of only one thread, and this is a slow mechanism. So, they are collecting statistical information to face this issue with the more adequate priority. If any of you is facing this same issue, this is the correct place and moment to leave a reply. In my case this issue is forcing me to make tape backups in different days because of lack of time, and this is very problematic. As a workaround I can suggest you to configure backup encryption in source job instead of enabling it in tape job. Thanks for the suggestion. I will try it, but if the problem is due to the encryption routines, I think the problem will remain the same, only that this time it will be in a file backup job instead of in the tape backup job. Just out of curiosity - does you tape device have a testing tool, using which you can verify the speed of tape write operations with and without hardware encryption? The idea here is to check whether this is indeed a limitation we can possibly address. Thanks. I ran into something similar last year and the gist of the issue is this: if you are not using hardware encryption, this is to be expected. Newer CPUs have some additional AES acceleration hardware/instructions that can speed software encryption up a bit, but it still won't be as fast as encryption done by the library itself. Unfortunately for you, LTO-3 does not even support hardware encryption. It appears that software encryption for tape jobs, indeed, has a slow performance comparing to the device hardware encryption. Suggestion to use encryption within the source backup job is good and should be faster than software encryption in tape job. We will investigate the software encryption performance issue and fix it in upcoming releases. Thanks! This tape technology work great so long that enought data are sent to the drive. This stop/Start sequence is very slow... In Order to avoid such situation, IT is necessary to ensure that a significant data flow is sent to the tape drive = parallellism and eventually no encryption. Also, LTO3 is a very old technology. Maybe moving to a newer LTO solution will fix your problems? Software tape encryption is a CPU releated problem. I have tested Veeam with software tape drive (Firestreamer) on my Xeon e5 2665 workstation and i7-6700hq laptop . On an external SCSI HP LTO3 FH tape drive connected to my Xeon workstation the real speed with encryption is only about 43MB/s. 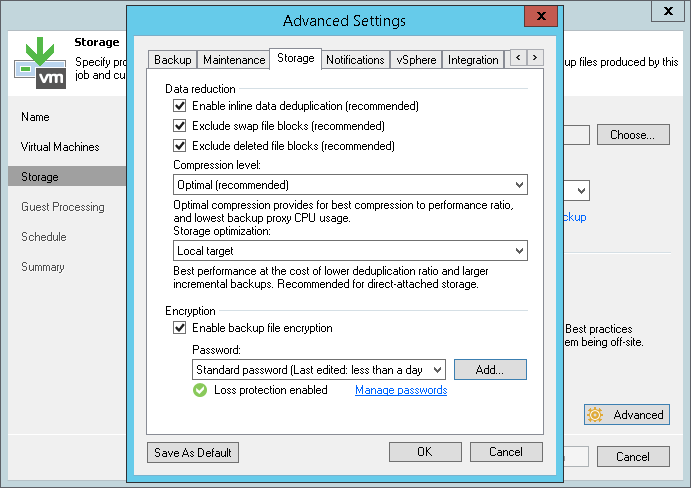 Acronis Backup 12.5 does much better – above 70MB/s. So Veeam Team, there is an example to follow.